Location Services is auxiliary to a lot of apps on the iPhone — Camera uses it to geotag photos, that is to add information about where the photo was taken in addition to putting a time and date stamp on it, and Reminders uses it to alert you to a task when you arrive at or leave a specified address. For Maps and Compass, however, Location Services is essential in order to get the most out of the app. Without Location Services, Maps can give you directions from one address to another and the Compass can give you magnetic north. If you want to know where you are, or want true north, you have to turn on Location Services in Settings. Maps uses your location to give you the best local information available, whereas the Compass uses your location to identify true north. The first time an app wants to use Location Services, a notification message appears asking if you want to allow the app to use your location. You can choose yes or no. Tap Privacy→Location Services, and then tap the toggle switch On. 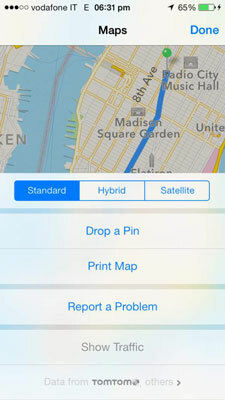 The Location Services list opens and displays all apps that can use your location in one way or another. When Location Services is being accessed by an app, its icon appears in the status bar. Turn Location Services on or off for each app. Purple icon the app has recently used your location. Gray icon the app has used your location in the last 24 hours. Purple outlines icon the app uses a geofence, which is a limit to the location and is used by apps like Reminders to alert you when you leave or arrive at a specified address. Location Services must be on for Find My iPhone to work. This should be a strong incentive to use a passcode to lock your iPhone. Otherwise, whoever “finds” your iPhone could just turn off Location Services and render Find My iPhone useless.